Glencoe is blessed with some of Britain’s finest high level mountain walking country. The routes and opportunities for adventure are endless, but here are just a few of the many classic routes that the experienced hillwalker will enjoy. Situated just east of the village this attractive and rounded cone makes for a good half-day outing and offers superb views of the Glencoe, Loch Leven and Ardgour hills. A straight-forward walk from the old road half-a-mile from the bridge leads into a gully and then across peaty moorland. The way gets rockier as height is gained before the track steepens over rock near the summit. 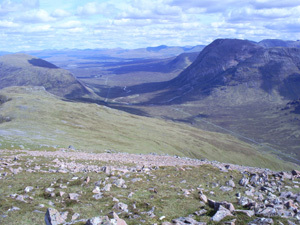 An alternative descent route leads south from the summit to the bealach between it and the neighbouring peak Sgorr nam Fiannaidh. Also known as the ‘Leven Horseshoe’. Leaving West Laroch, a steep ascent leads to the first peak, Sgorr Bhan, beyond which a superb sweeping and narrow ridge leads to the main top Sgurr Dearg. Descend west from the summit to a col before a final ascent to the third top Sgorr Dhonuill. Retrace you steps to the col and descend north through a forested valley to South Ballachulish. An alternative and shorter route goes straight up the mountain’s north ridge from Ballachulish. Although this makes a classic traverse of the mountain difficult to achieve, the way is blessed with marvelous views towards the Mamores, Loch Leven and Ben Nevis. THE classic route in the glen, but not for those with vertigo or faint hearts! Start at the car park near ‘The Meeting of the Three Waters’ and head straight up to the summit of Am Bodach. From here the route is unmistakable and unavoidable, traversing an increasingly narrow ridge with rock pinnacles. Do not descend until you have reached the last peak – Sgorr nam Fiannaidh. Then head for the col between it and the Pap of Glencoe. Traverse back to the old road and then on to Clachaig for a well deserved pint! One of the most famous of Scotland’s mountains and a classic viewpoint for Rannoch Moor and Glen Etive. There are several routes up the mountain of varying difficulty, the easiest of which is by way of the Cloiche Finne Coire in Glen Etive. The route leads easily up the centre of the coire to reach a bealach. 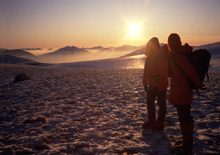 The main summit is then half-a-mile due west. A grand mountain and the highest in Argyll. It has a very complex structure with many converging ridges, and has a reputation of being unforgiving in bad conditions if one is not familiar with its topography. For a classic ascent take the rock scramble up Dinner-time Buttress on Aonach Dubh onto Stob Coire nan Lochan, and then follow the narrow ridge to the main summit. Turning west, the descent over Stob Coire nam Beith and down into the coire from the Bealach beyond gives a round which includes Bidean’s three main tops over 3000 feet in height. Warning: The routes briefly described are only recommended for those with some mountaineering or strenuous hill-walking experience. In good weather they demand a high degree of commitment; in bad weather, or in winter, they can be very serious mountaineering undertakings calling for technical equipment and a knowledge of how to use it. Particular mention is made of the Aonach Eagach ridge which is a very serious undertaking, particularly in winter conditions and should not be under-estimated!